Concrete technology continues to advance rapidly and modern mixes with five components – cement, additions, aggregates, (chemical) admixtures and water – often have characteristics which differ significantly from the older three component mixes – cement, aggregates and water. Recent trends have favoured higher strength classes and lower water/cement ratios, resulting in greater dependence on admixtures to compensate for reduced workability and to meet the competing demands for workability in the fresh state and setting time. The application of testing methods which reflect the true rheological properties of the concrete has not developed at the same rate as the mixes themselves and it is still not uncommon for the slump or flow table test to be used as the only acceptance test for the fresh concrete. 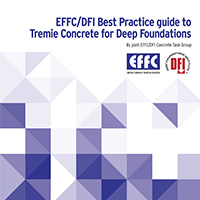 A review of problems in bored piles (drilled shafts) and diaphragm walls cast using tremie methods by both the European Federation of Foundation Contractors (EFFC) and the Deep Foundations Institute in the United States (DFI) identified a common issue that many of the problems were caused by (or in part due to) the use of unsuitable concrete mixes (insufficient workability, stability and/or robustness). Inadequate concrete specifications and insufficient testing procedures were identified as a primary cause. The consequences of these problems are often significant and it has been recognised that spending more on getting the concrete right is the most cost effective approach. A joint Concrete Task Group was set up by EFFC and DFI in 2014 to look at this issue. The Task Group comprises leading industry figures from Specialist Contractors, Consulting Engineers and Suppliers and is chaired by Dr.-Ing. Karsten Beckhaus. It quickly became apparent to the Task Group that Research and Development work was urgently needed to improve our understanding of many of the key issues. Sponsors were sought to fund the R & D work and the response was very positive. The Research and Development Project is now being carried out by the Technical University of Munich in conjunction with the Missouri University of Science and Technology. This project includes desk studies, laboratory testing, and onsite testing at worksites in Europe and the US. The research work will be completed during 2016. The primary purpose of the Guide is to give guidance on the characteristic performance of fresh concrete and its method of placement using tremie methods in bored piles and diaphragm walls, allowing construction of high quality elements. Getting the mix right can only be achieved in a joint approach by the Specialist Contractor (to achieve the execution requirements), the Designer (to meet the durability and structural needs), and the Supplier (to produce an economic and practical mix). The Task Group has carried out a detailed assessment of current best practice and research. It is hoped that this guide will provide information for use in future European and American Standards. This first edition of the Guide proposes appropriate performance criteria for the concrete together with test methods and initial recommendations on acceptance values. A second edition of the Guide will be published on completion of the Research and Development work as this will allow definitive acceptance criteria to be presented. The Guide also addresses design considerations including concrete rheology, mix design, reinforcement detailing and concrete cover as well as best practice rules for placement. A review of methods to test the as-built elements is presented together with advice on the identification and interpretation of results. The Guide is aimed at those involved in the procurement, design, and construction of bored piles (drilled shafts) and diaphragm walls including Owners/Clients, Designers, General Contractors and Specialist Contractors. It is intended as a practical addition to existing standards, not a substitute.